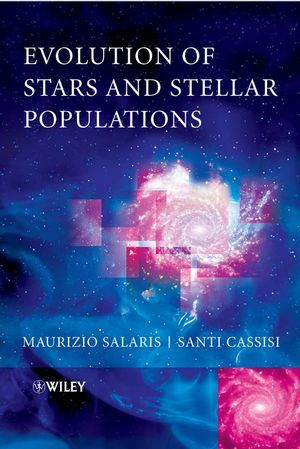 Evolution of Stars and Stellar Populations is a comprehensive presentation of the theory of stellar evolution and its application to the study of stellar populations in galaxies. Taking a unique approach to the subject, this self-contained text introduces first the theory of stellar evolution in a clear and accessible manner, with particular emphasis placed on explaining the evolution with time of observable stellar properties, such as luminosities and surface chemical abundances. This is followed by a detailed presentation and discussion of a broad range of related techniques, that are widely applied by researchers in the field to investigate the formation and evolution of galaxies. This book will be invaluable for undergraduates and graduate students in astronomy and astrophysics, and will also be of interest to researchers working in the field of Galactic, extragalactic astronomy and cosmology. Maurizio Salaris studied physics at the University of Rome 'La Sapienza', and then worked at the Collurania-Teramo-Observatory, Italy, the Institut d'Estudis Espacials de Catalunya in Barcelona, Spain, the Max Planck Institute for Astrophysics in Garching, Germany, and the Astrophysics Research Institute of the Liverpool John Moores University, UK, where he currently holds the post of Professor of Stellar Astrophysics. He has published about 150 papers in peer-reviewed journals and books, plus a monograph, co-authored by Santi Cassisi. Professor Salaris's scientific work focuses on theoretical stellar evolution, stellar population synthesis models, and the interpretation of photometric and spectroscopic observations of Galactic and extragalactic stellar populations. Santi Cassisi received his degree in physics from the University of Pisa, Italy, in 1991. He then spent a year at the Astronomical Observatory of Meudon-Paris, France, followed by a PhD-fellowship at the University of L'Aquila, Italy, from 1995 to 1997. In 1998, he accepted a post as staff researcher at the Collurania-Teramo-Observatory, a research unit of INAF. He currently holds a position as associate professor at the same institution. Professor Cassisi's research focuses on theoretical stellar evolution and its application to the study of both galactic and extra-galactic stellar populations. He has authored about 210 scientific papers, 115 of them in peer-reviewed journals, and a monograph. 1. Stars and the Universe. 1.2.1 Cosmological redshifts and distances. 1.5 CMB fluctuations and structure formation. 1.8 The role of stellar evolution. 2. Equation of State of the Stellar Matter. 2.1 Physical conditions of the stellar matter. 2.1.1 Fully ionized perfect gas. 3. Equations of Stellar Structure. 3.1.5 The opacity of stellar matter. 3.1.7 Evolution of chemical element abundances. 3.1.9 Virial theorem and electron degeneracy. 3.2 Method of solution of the stellar structure equations. 3.2.1 Sensitivity of the solution to the boundary conditions. 3.3.1 Atomic diffusion and radiative levitation. 3.3.2 Rotation and rotational mixings. 4. Star Formation and Early Evolution. 4.1 Overall picture of stellar evolution. 4.3 Evolution along the Hayashi track. 4.3.1 Basic properties of homogeneous, fully convective stars. 4.3.2 Evolution until hydrogen burning ignition. 5. The Hydrogen Burning Phase. 5.2.3 The secondary elements: The case of 2H and 3He. 5.3 The central H-burning phase in low main sequence (LMS) stars. 5.4 The central H-burning phase in upper main sequence (UMS) stars. 5.5 The dependence of MS tracks on chemical composition and convection efficiency. 5.9.1 Intermediate-mass and massive stars. 5.10 Dependence of the main RGB features on physical and chemical parameters. 5.10.1 The location of the RGB in the H-R diagram. 5.10.2 The RGB bump luminosity. 5.10.3 The luminosity of the tip of the RGB. 5.11 Evolutionary properties of very metal-poor stars. 6. The Helium Burning Phase. 6.3 The zero age horizontal branch (ZAHB). 6.3.1 The dependence of the ZAHB on various physical parameters. 6.4 The core He-burning phase in low-mass stars. 6.5 The central He-burning phase in more massive stars. 6.5.1 The dependence of the blue loop on various physical parameters. 6.6 Pulsational properties of core He-burning stars. 6.6.1 The RR Lyrae variables. 6.6.2 The classical Cepheid variables. 7. The Advanced Evolutionary Phases. 7.2 The asymptotic giant branch (AGB). 7.2.1 The thermally pulsing phase. 7.2.2 On the production of s-elements. 7.2.3 The termination of the AGB evolutionary phase. 7.3 The Chandrasekhar limit and the evolution of stars with large CO cores. 7.4.3 Detailed WD cooling laws. 7.4.4 WDs with other chemical stratifications. 7.5 The advanced evolutionary stages of massive stars. 7.5.5 The collapse of the core and the final explosion. 7.6.1 The Type Ia supernova progenitors. 7.6.3 The light curves of Type Ia supernovae and their use as distance indicators. 8. From Theory to Observations. 8.1 Spectroscopic notation of the stellar chemical composition. 8.2 From stellar models to observed spectra and magnitudes. 8.2.1 Theoretical versus empirical spectra. 8.3 The effect of interstellar extinction. 8.4 K-correction for high-redshift objects. 8.5 Some general comments about colour-magnitude diagrams (CMDs). 9.2 Old simple stellar populations (SSPs). 9.2.1 Properties of isochrones for old ages. 9.2.3 Metallicity and reddening estimates. 9.2.4 Determination of the initial helium abundance. 9.2.5 Determination of the initial lithium abundance. 9.2.7 Luminosity functions and estimates of the IMF. 9.3 Young simple stellar populations. 9.3.2 Metallicity and reddening estimates. 10.2 Determination of the star formation history (SFH). 10.3.1 The planetary nebula luminosity function (PNLF). 11.3 Distance to unresolved stellar populations. Appendix II: Selected Web Sites. Introduces the theory of stellar evolution alongside its applications to stellar populations. Presents a comprehensive analysis of the physics necessary to understand how stars work and how they evolve.